آیا تابحال برای شما هم پیش آمده که هنگام طراحی یک سایت جدید از ساخت منو برای تک تک مجموعه ها یا مطالب خسته شده باشید؟ آیا وقت برای وارد کردن توضیحات متا و متاگ ها برای تک تک منوها ندارید؟ آیا ده ها یا صدها مجموعه برای مطالب دارید که قصد دارید برای تک تک آن ها منو بسازید؟ خب چاره کار شما افزونه JLinker Menu Generator PRO می باشد. این افزونه یک کامپوننت منوساز خودکار برای شماست. توسط این افزونه و تنها با چند کلیک می توانید برای مطالب یا مجموعه های مورد نظر خود منو همراه با متات، توضیحات متا با نوع های مختلف بسازید. همچنین این افزونه به شما اجازه میدهد قبل از ساخت منو لینک یا عنوان منوها را نیز به صورت دسته جمعی در صورت نیاز تغییر دهید. این افزونه برای ساخت منوی خودکار در افزونه های: K2, Virtuemart, JDownloads, Phoca Downloads and Community Builder و خود جوملا کاربرد دارد. این افزونه بسیار مورد کاربرد طراحان سایت می باشد و موجب صرفه جویی زمان و تحویل سریعتر پروژه می شود. JLinker Menu Link Generator can reproduce content tree structures in the menu links created. For example, if you want to generate links for Joomla categories with a parent/child items structure, the extension will take care of creating the corresponding parent/child link structure in the target menu. You can generate hundreds or even thousands of menu links, in just a few clicks! Extensions are also available for K2, Virtuemart, JDownloads, Phoca Downloads and Community Builder. 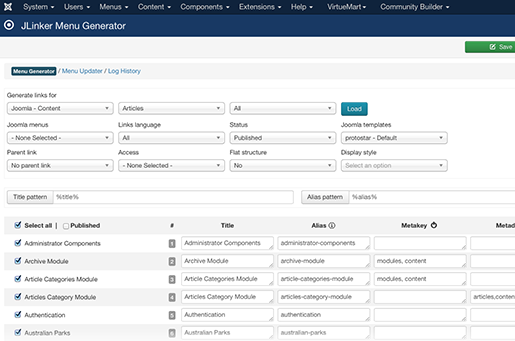 JLinker Menu Link Generator creates native Joomla menu links. 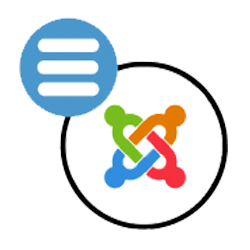 The created links are fully SEO compliant and will work the Joomla way for the aliases creation. Load content by extension and select items to generate links for. There is a parameter on Apache servers called maxinputvars. This parameter says how many variables can be passed to the server in one request. By default, maxinputvars is often set to 1000, which means that you will not be able to generate more than 1000 links at once with JLinker Menu Link Generator. If you try, the server will just reject the request silently and no links will be generated. If you have more than 1000 links to generate, you should probably make sure this php.ini parameter has been adjusted to fit your needs. مجموع افزونه ها و قالب های موجود در سایت 3,526 فایل در 331 گروه بندی می باشد. این فایل ها تاکنون 37,706 بار دانلود شده اند.